Valentine’s Day may be traditionally associated with sweet treats like chocolates but why not try something different this year? 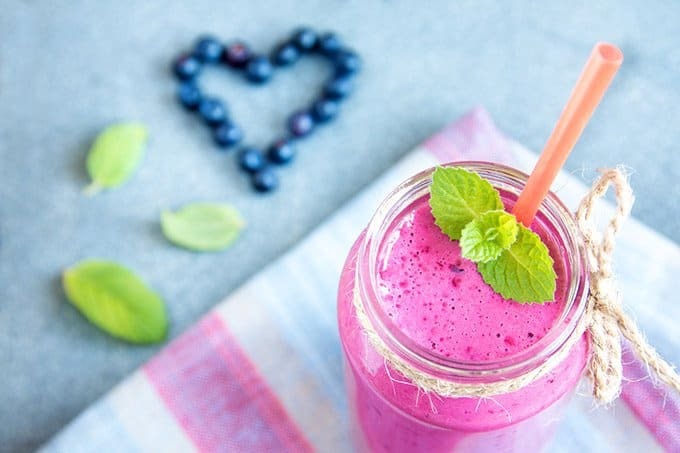 Some smoothie recipes are perfect choices for the big day, with a creamy sweet taste, vivid reds and pinks, and with the added bonus of all the health benefits of smoothies. 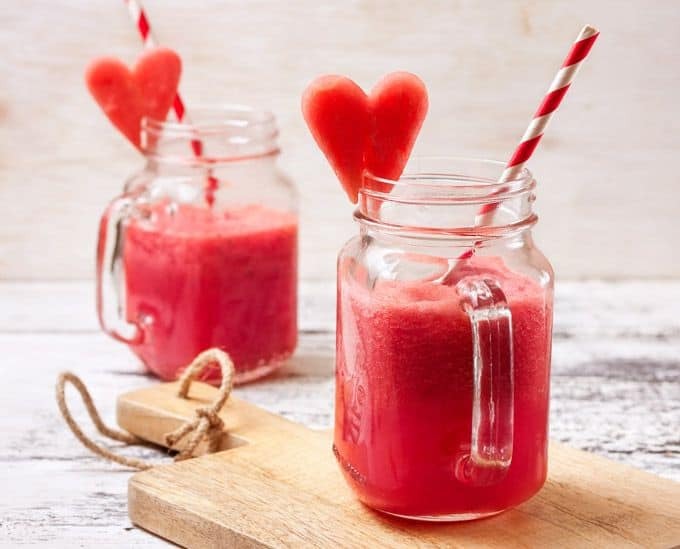 I’ve got here 5 great smoothie recipes for Valentine’s day that you can share with your sweetheart at different times of the day - could be for breakfast, dessert, a snack and more. The servings are for two people so grab a straw each and enjoy the benefits! Click the button below and I'll send it to you! Want to start Valentine’s Day off with a romantic breakfast-in-bed smoothie? The pink-red color is sure to make you both get in the Valentine’s mood and it’s full of ingredients to keep you feeling fuller for longer. The fiber in the strawberries and protein in the peanut butter are great for keeping those cravings at bay… perfect if you’re hoping to save calories for a romantic meal in the evening! Blend all ingredients together in your blender until smooth and creamy. 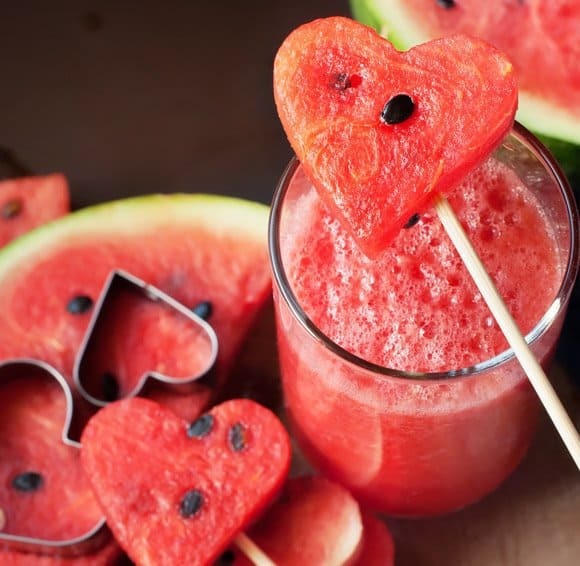 For the watermelon hearts - use a heart-shaped cookie cutter. You can either attach the hearts to the glasses or put on a thin wooden stick - see picture below. Want to grab a quick lunch together on Valentine’s Day? This fruity smoothie is a delicious and healthy combination of fruits, plus using soymilk over regular milk gives even more nutrients. 1. Add the soymilk, all of the frozen fruit and maple syrup to your blender and mix until relatively smooth. 2. Add the fresh banana and blend again until smooth. 3. Add the fresh strawberries and blend again but do this gradually as you don't want the strawberries to be too mushy for this smoothie to work. 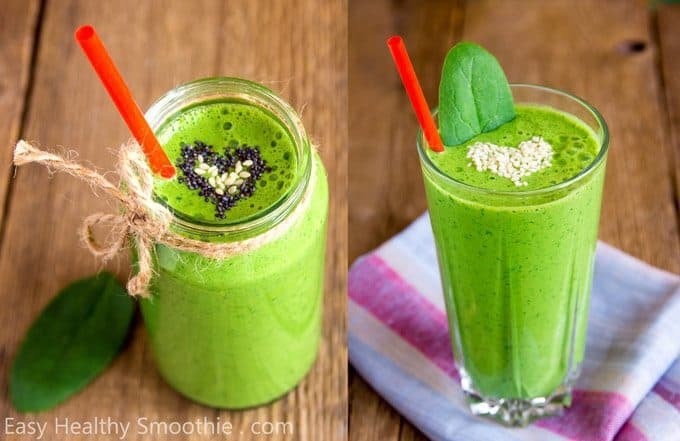 I love a green smoothie and this is one that works great for a Valentine’s dinner. It’s heart healthy, which is apt for Valentine’s Day! It’s also full of omega 3 fatty acids and contains vitamin C for stronger immunity. Add the ingredients to your blender and blend until smooth. This delicious but deceptively healthy smoothie makes the perfect replacement for a sinful dessert. It’s the smoothie version of strawberries dipped in decadent chocolate, and who doesn’t love that idea on Valentine’s Day? 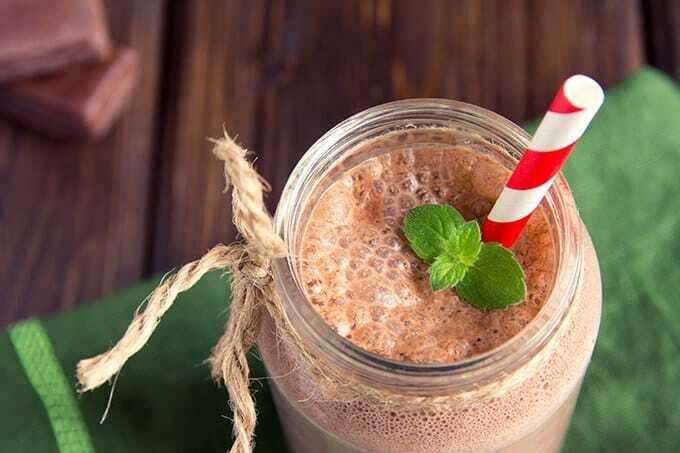 This dessert smoothie is no mere indulgence though; with dark chocolate, cocoa, Greek yogurt and berries, it’s packed full of antioxidants, protein and fiber. Pour into a serving glass and drink straight away. 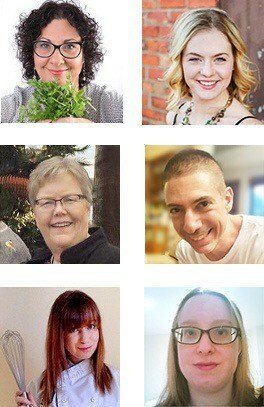 Looking for a vegan Valentine’s smoothie recipe that’s totally yummy? This fruity concoction feels more like an indulgent treat than the healthy smoothie it actually is. Best of all, it’s perfect for vegans who want to create the ultimate Valentine’s Day smoothie. You’ll love sharing this with your other half! Melt the dark chocolate on medium heat and stir often. Once melted, take off the heat and set aside while you prepare the smoothie. 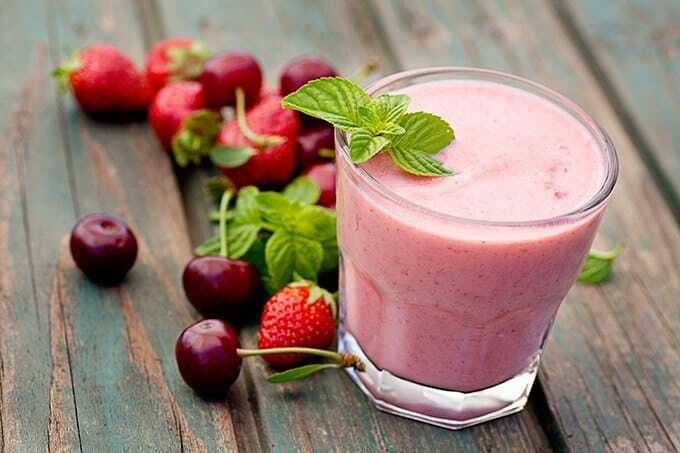 Add the strawberries, cherries, banana, milk, coconut milk, vanilla and maple syrup to your blender and mix until smooth. Pour into serving glasses and drizzle the chocolate sauce over the top. I really hope you enjoyed reading this post and got some ideas for smoothies you can make this Valentine’s Day? Please feel free to share it too. As you can see, lots of smoothie recipes can be given a romantic Valentine twist. Let me know in the comments which ones have inspired you the most! 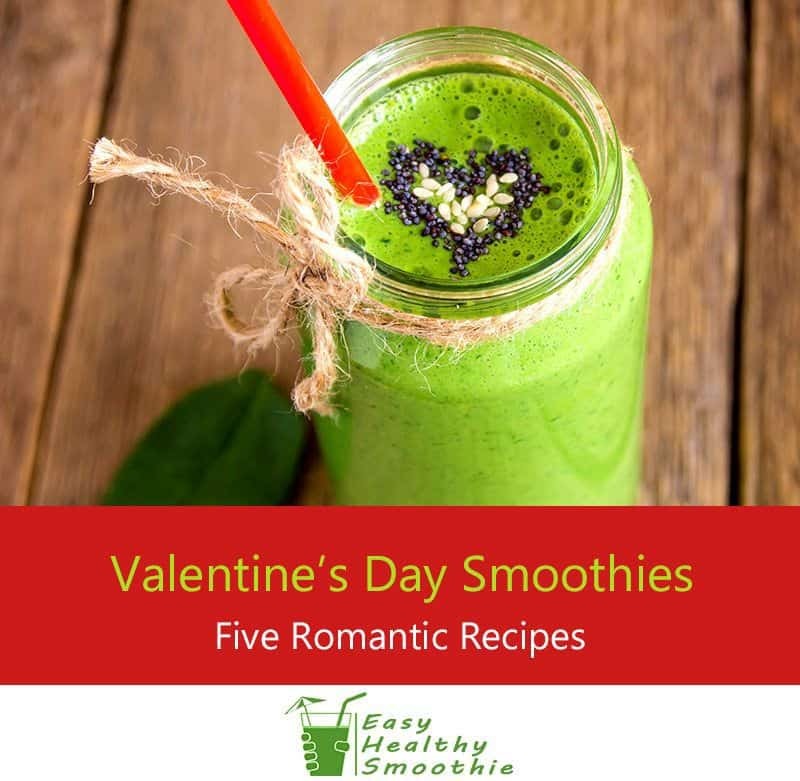 Celebrate Valentine’s Day with these 5 Great Smoothies - they’re natural, delicious, easy to make and… romantic! Wow, thanks so much for this post – I had no idea smoothies could be so romantic! I’m loving the sound of the dark chocolate and strawberry smoothie. Maybe I won’t just save it for Valentine’s Day though! Smoothies can be pretty much anything you want to be, I reckon! Awesome that my smoothie habit can be adapted even for Valentine’s Day! 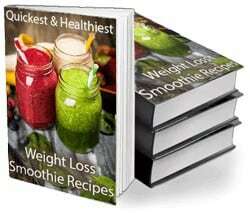 I’m loving the look of all of these smoothies, can’t decide what to test out first! Exactly, Mike … smoothies are just so versatile! Wow, these all sound great and perfect for Valentine’s Day! Glad you like the recipes, Dominic! I’m so excited to see I can even make my smoothies romantic for Valentine’s Day! That one seems to be very popular, just as I thought it would be! Hope you got those brownie points, Darren!